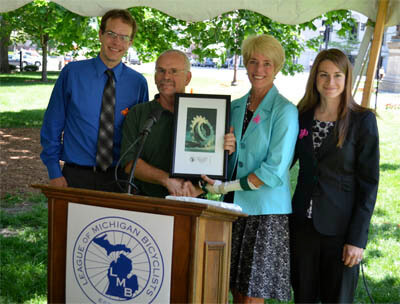 LMB recognizes Michigan bicyclists that embody our mission to promote bicycling and the safety of bicyclists on our state's roadways. Help us recognize an outstanding individual in your community by nominating an individual for an LMB award. Given to an individual for service to LMB during a lifetime. Given to an individual for service during the past year; for advocacy efforts on behalf of bicycling to local, regional or state governments. Given to a business, organization or local group for support during the past year; for activities that support making Michigan a better place to bicycle. Given to an individual for demonstrating a “passion” for bicycling. 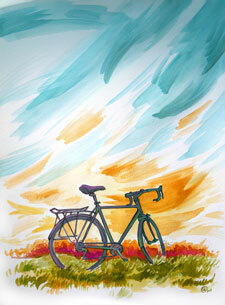 Given annually to an individual to a person that encourages others to get involved in bicycling. 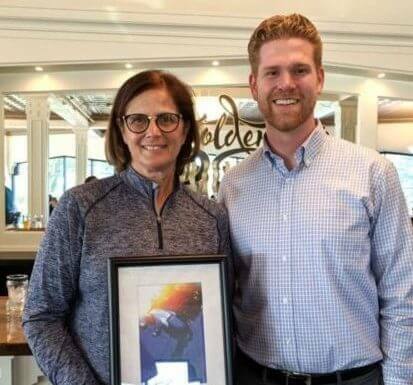 Cindy Okerlund, a retired Harbor Springs teacher, has developed and administers the Kids Biking Initiative (KBI), in conjunction with the Top of Michigan Trails Council and various community sponsors. For the last three years, the KBI has provided a recreational and educational opportunity for 4th graders in various school districts in Emmet County. During the five weeks from early May to early June, 15 groups of 4th graders from Petoskey, Harbor Springs, and smaller school districts in Emmet County ride about 7.5 miles round trip on the North West State Trail between Spring Lake Park and the Oden Fish Hatchery with a team of adult volunteers and teachers. Earlier in the year, Cindy visits the schools to assess the kids' riding skills and abilities and measure them for the proper bike size. Kids who are unable to ride, or whose skills are not quite up to the task, are accommodated by pairing them with an adult volunteer on either a tag-along or a tandem bike. The group even has a side-by-side recumbent tandem that has been used to accommodate kids with disabilities. Five years ago, Tracy used a simple hashtag on social media to highlight her love of bicycling with her son around her hometown: #BikeDearborn. It has since evolved into the grassroots group that exists today. Not only did she found the organization, she is an advocate for bicycling infrastructure improvements in Dearborn and was the major player involved in getting the City of Dearborn to pass a 5-foot passing law in 2017. Through Tracy’s dedication, determination and passion for bicycling, Dearborn, the hometown of Henry Ford and Ford Motor Company, is quickly becoming a leading bicycle-friendly city. Steve has been on the Board of Directors and Lifetime Member of LMB since 2007. During LMB’s early years, Steve revamped and established the organization’s the bylaws, personnel policy, and the governing structure. During his time on the Boards, Steve has offered invaluable pro bono legal help and recruited other quality board members. 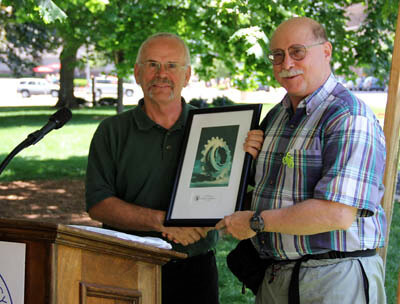 Throughout his years of service, Steve has been a tireless advocate for LMB tours, a regular attendee of Advocacy Day, and attended the National Bike Summit on behalf of LMB. Becky and Kenn founded Holy Spokes in 2017 after Kenn’s idea to do something to help individuals and families in and around their community in Lake Orion. May 2, 2018, marked one year of Holy Spokes. As of that date, Holy Spokes has donated 581 bicycles to individuals and organizations within a 30-mile radius of Lake Orion. Holy Spokes continues to provide bicycles to low-income individuals, persons with special needs, the homeless, veterans, and more. Additionally, on May 16, 2018, Kenn and Becky hosted the first Lake Orion Ride of Silence and Ralph’s Ride in memory of Ralph Finneren. In 2012, the City of Royal Oak commission adopted a Non-Motorized Transit Plan and embarked on a citywide sidewalk program to increase mobility around the city. In 2013-14, the city received a TAP Grant to install Bike Route Signage throughout the city. Also in 2014, the city installed dedicated bicycle parking locations throughout downtown, sharrows throughout the city, a permanent bike lane on 4th Street. In 2015, Royal Oak collaborated with neighboring cities to develop a connected neighborhood bicycle route. The city also adopted a master plan amendment to include protected bicycle facilities along Woodward Avenue. As part of its 2016 Strategic Plan set by the City Commission, Royal Oak adopted a goal of incorporating pedestrian and bicycle amenities into every Public Works project. This led to the formation of a Bicycle and Pedestrian Safety Subcommittee, with the direction of identifying a major North-South bike route through the city. Through the work of that subcommittee and adopted by the City Commission in 2017, the city will be installing approximately 6 miles of dedicated bicycle lanes in summer 2018. 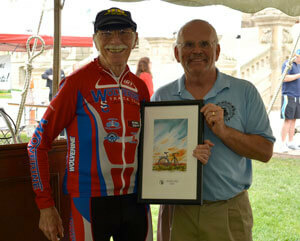 Lenny has been a lifelong bicyclist and very dedicated advocate for bicycling for many of those years. He's passionate about encouraging and advocating for all types of bicycling including those who bicycle out of necessity, not choice. Lenny has devoted countless hours to this advocacy work and to attending boring governmental meetings where he has been the ever-present voice for bicyclists. Lenny also practices what he preaches and can be seen riding his bike to many of those meetings as well as area recreational rides like with the Lansing Bike Party of which he was a founding member. This is our first inaugural award to showcase legislators with a passion for safer roads. Representative Hughes was not only our bill sponsor through the fight for e-bike clarification, but also helped usher through our obstructed license plate law and our safe passing law. Michael Seaman was killed by an intoxicated driver while riding his bicycle on June 27, 2017, near Mt. Pleasant. He was a well-known Mt. Pleasant cyclist, adventurer, and Montcalm Community College instructor. Michael lived to pass on his knowledge and excitement, including his passion for riding. He encouraged and helped others to be better at biking, skiing, or anything they set out to do. He shared his skills, experience, wisdom, and mistakes to encourage and excite others to be better, do better, and enjoy more. He gladly rode bikes with amateur bicyclists, because those were the people trying their hardest. He loved and laughed and he is greatly missed by his loved ones and his community. Yvonne is the Executive Director and Founder of BikeVON, a non-profit organization created to promote bike awareness, affordability, and accessibility for the youth of color in the Metro Detroit area. BikeVON teaches the laws and rules of smart cycling while showing communities how to support cycling. The organization also represents the League of American Bicycling’s Equity Initiative, which “seeks to engage leaders from traditionally underrepresented demographics and bridge the current gap between diverse communities and bicycle advocates.” Through her work with BikeVON, Yvonne empowers youth of color in Detroit in the movement to create safer roads, stronger communities, and a bicycle friendly Detroit. Additionally, Yvonne is member of the MDOT non-motorized committee, the Detroit Greenways outreach committee, and the League of American Bicyclists. Michael Reuter is the CEO of American Cycle and Fitness, Michigan’s largest independent bicycle retailer. He has been an advocate for cycling since entering the bicycle industry in 1993. Michael regularly attends LMB’s Bicycle Advocacy Day as well as the League of American Bicyclists’ National Bike Summit in Washington DC. American Cycle and Fitness has helped to promote cycling throughout the state with its support for local cycling events and tours, and through the service and knowledge they share with every customer. Additionally, ACF donates trade-in bicycles that do not sell from their outlet store to The Hub of Detroit, who uses them to educate children about bicycle repairs. As a father, Michael is concerned about the safety of children cycling in his community and he approaches every day with the hope of making his community more bicycle-friendly for them. He also enjoys cycling as a pastime with his wife and children, and has taken his family on many bike tours. Rick first become involved with LMB shortly after meeting Lucinda Means and becoming infected with her “Leadership by Example” ethos. Upon Lucinda’s untimely passing, Rick stepped in as the Interim Executive Director of LMB. He was instrumental in keeping operations moving during that time, while still introducing new ideas and approaches to the organization, including the implementation of an online registration and membership system. Since then, Rick has maintained active administration of LMB’s electronic databases. Beyond LMB activities, Rick works to cultivate a healthy bicycling culture in Michigan, including helping to grow the Lansing Ride of Silence to the major event it has become. Rick has also been instrumental in many other major rides, including the Kal-Haven Trailblazer and the Michigander. 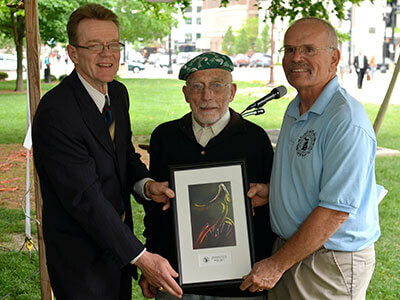 He was one of the founders of the Michigan Chapter of the Rails to Trails Conservancy (now the Michigan Trails and Greenways Alliance), and was a founder and the first Chairman of the Friends of the Kal-Haven Trail. Rick is also a member of the TNR Cycling Club, Lansing’s racing club. Rick goes above and beyond as a race promoter. His business, KissCross Events, puts on the Barry Roubaix, Lumberjack, and a number of cyclocross races. These great events make bike races a lot of fun for the participants and for spectators. He gets people riding and encourages many who might not consider racing to give it a try. His events, especially Barry Roubaix, increase bicycle tourism and have turned an otherwise quiet community into a community that embraces bicyclists. Rick has worked with the City of Hastings, the Hastings Downtown Development Authority, and the Barry County Road Commission to have permanent route marking signs installed for the Barry-Roubaix courses. During last year’s Shoreline West Tour, Ed, Luanne, and Suzy went above the normal call of duty as volunteers when major storms rendered the planned route impassable and dangerous. These three individuals worked hard to re-route the riders to ensure their safety, even clearing the road of debris when routes became blocked. 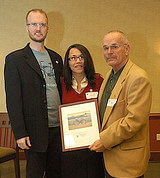 Ed and Luanne St. Peter first became involved with LMB in 2008 as volunteer route markers. Luanne takes on the task with diligence, undertaking a responsibility to keep the riders safe as many of them rely solely on the road markers rather than maps to find their way. Ed began volunteering with LMB as a way of being able to spend quality time with Luanne. As a team, they mark the roads for LMB’s Shoreline West and Pedal and Paddle Tours. Luanne has also expanded her volunteer responsibilities to include helping to welcome and register riders. Suzy McCain began biking in 1995 and was hooked. She developed a passion for long distance cycling and has ridden in over 70 centuries. After a serious bicycling crash in 1998, Suzy was forced to cut back riding and began volunteering with LMB to stay involved in the world of cycling. She drove the “SAG” for several years on LMB’s Bowtie until it ended, moved on to do the same for one year on MUP, then started driving SAG on the Shoreline West. In 2004, after the birth of her granddaughter Chloe, Suzy switched to role of Site Director so that Chloe could begin joining her on the rides. Since then, Suzy has acted as Site Director for the Shoreline West, with Chloe at her side. As a life long bicyclist he has a great passion for advocating for the sport he loves. 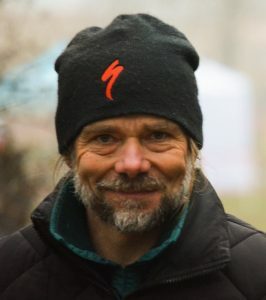 He has been involved locally with the Kalamazoo Bike Club, the Southwest Michigan Bicycle Expo and regularly submits articles to his club newsletter. Last year he was active in ensuring that the Kalamazoo County Road Commission’s “first” Non Motorized Policy included bicyclist’s needs. He took it upon himself to meet with staff and administration to encourage the Road Commission to address the needs of bicyclists in the plan. His efforts in reviewing and suggesting changes resulted in a Non Motorized Plan that is favorable to bicyclists. Deb has been the key volunteer for LMB’s Pedal and Paddle event in Three Rivers. Two years ago she invited LMB staff to visit the area and meet with local volunteers about the possibility of moving Pedal and Paddle to Three Rivers. We held the first event there in 2013 (and again in 2014). Deb was the key link between LMB staff and local volunteers. When something needed to be done she always stepped up and took on the responsibility. She was not only very active in the event planning, but also very hands on in the actual running of the event. There would be no Pedal and Paddle in Three Rivers without Deb. The first Tour de Troit event was in 2002, organized in the spirit of having fun on a bike, followed by conviviality and beer. The event quickly grew, and expanded its focus to include promoting cycling, Detroit, and raising funds for cycling education and infrastructure. In 2012, Tour de Troit incorporated as a non-profit, and obtained its charitable 501(c)(3) status. The mission of the Tour de Troit is to promote and encourage bicycling and bicycle safety through education, public events, collaboration with community and government organizations and support for non-motorized infrastructure. The Tour de Troit, the city’s largest cycling event, raises awareness of biking as a mode of transportation and publicizes the growing greenways network in the City of Detroit and all of Southeastern Michigan. It attracted over 6,000 participants in 2013, and has a goal of 10,000 for 2014. Tour de Troit also produces and supports other events that promote a healthy lifestyle and the city, including the Martin Luther King, Jr. Memorial Bike Ride, Paczki Run, Run du Nain Rouge, Cycle Into Spring, and Bike the Bridge, one of the few international rides in Michigan, and the only one that crosses the Ambassador Bridge. Steve is a founding member of the League of Michigan Bicyclists and served on its Board of Directors from 1980 to 1983. The Michigan Bicyclist, edited by Steve served as the unofficial LMB publication until it was formally transferred from the Tri-County Bicycle Association to the League of Michigan Bicyclists in 1983. Steve was elected to the Board of Directors of the League of American Wheelmen (now League of American Bicyclists) in 1982. He held offices of Secretary and Treasurer while on the LAW Board. Steve currently serves as Treasurer of the Tri-County Bicycle Association of Lansing. He Chairs the DALMAC Fund Committee, serves on the DALMAC Committee, the TCBA Advocacy Committee and assists in teaching the League of American Bicyclists’ Smart Cycling program. Steve has continued his involvement with LMB and is a regular participant in the annual Advocacy Day event as well as many LMB Tours. Bike Camp began with a one-day event at a local trail with nine people in 2005. Currently it is a five day event that serves more than 50 people a year. It starts with an information night that covers bike selection, adjusting and parts, bicycling in traffic (traffic laws, changing lanes safely) and helping motorists Share the Road. The next four Saturdays are spent with a short presentation regarding a specific aspect of bicycling or fitness, followed by group training rides of various paces and distances, led by experienced cyclists. Bike Camp culminates with the Kal-Tour, the club’s local ride in Kalamazoo County. Since its inception, Bike Camp has helped more than 350 bicyclists in the Kalamazoo area learn or relearn how to bike safely. Bryan is an active bicycle racer, participating in road races, criteriums and cyclecross. When not racing he is pursuing his career as a lawyer with Sinas Dramis Law Firm. Over the last 20 years, he has represented numerous cyclist and outdoor athletes. Most are cyclists hit by cars or injured in dog attacks. This past summer he represented LMB's John Lindenmayer in his defense against an "Impeding Traffic" ticket . He authored, "A Legal Handbook For Michigan Cyclists," which is available through his firm, Sinas Dramis. He has also assisted LMB over the past year by writing position papers on various bills affecting bicyclists. Locally, Bryan has developed a standard letter pointing out the risks of sub standard road conditions that he sends to local road authorities whenever he encounters a road that is dangerous for bicyclists. 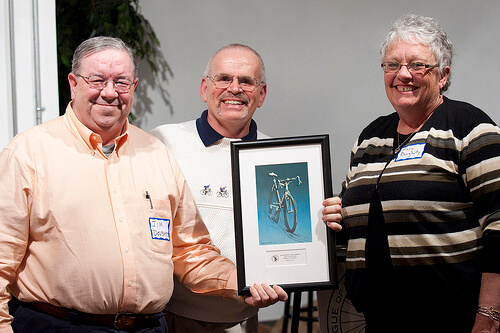 Bicyclists in Michigan and the Traverse City area lost a tireless bicycle educator in November of 2012 with the passing of Fred Schaafsma. We are honoring Fred posthumously with the Bicycle Educator Award. Fred was a member of the Cherry Capital Cyclist Club. 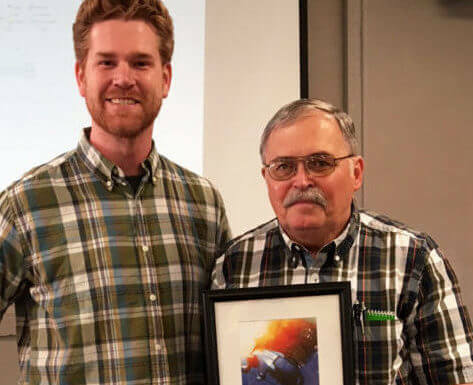 He organized their Education and Safety Committee and worked with and through that group to make the Grand Traverse area a better place for bicycling. He was also concerned about statewide issues and annually attended LMB's Advocacy Day and worked with LMB staff on various bicycle safety issues. Not only was Fred a passionate educator, he loved to have fun and compete. Many would say what made him so special was his wide-ranging interests and his passion for people and his passion for cycling. He would often remark, "who is going to look out for these kids?" Terri has been a long-time LMB volunteer. Over the years, she has volunteered for the Sunrise and MUP Bicycle Tours and has been a tireless advocate for bicycling in the Alpena area. In 2012 she was instrumental in the relocation of the Sunrise Bicycle Tour from Rogers City to Alpena, working with various community leaders to encourage them to pursue becoming the host city for the event. She then took a leadership role in recruiting a planning committee made up of local residents in the Alpena area. Her tireless efforts helped make the first Sunrise Tour in Alpena a huge success. 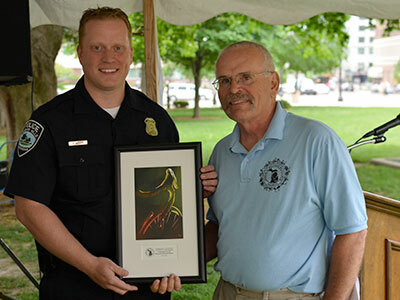 Auburn Hills Police Department(AHPD) has been a great advocate and supporter for bicycling in Auburn Hills, MI. They have a dedicated force that works to keep the roads of Auburn Hills safe for motorists, pedestrians, and bicyclists. AHPD sends officers to area health and safety events, distributes safety booklets for bicyclists including LMB's What Every Michigan Bicyclist Must Know, and hosts trainings for officers to better understand the Michigan Vehicle Code as it applies to bicyclists. They are performing community outreach around local Complete Streets implementation to ensure the public is aware of the new infrastructure improvements. The Auburn Hills Police Department is a shining example of how supportive a police department can be of bicyclists and other multi-modal options of transportation. Michael has been a long time LMB supporter and volunteer. In 1998 he became a member of the Board of Directors. Over the years he has volunteered for various LMB tours and other events, in addition to serving on the LMB board. 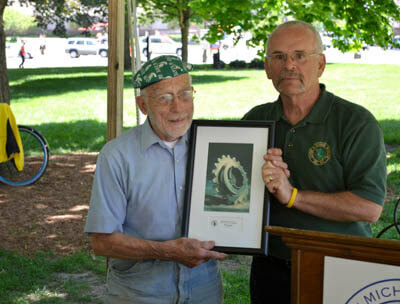 He has been a tireless advocate for bicycling in his community. He can often be seen attending various public meetings concerning issues that affect bicycling and vocalizing the need for accommodations for bicyclists. He routinely works with bike shops in his community to make sure that they have LMB educational materials and Ride Calendars. He has served as a liaison with numerous local bike clubs. Michael has also advocated for safe cycling by regularly meeting with local and state politicians. He attends LMB's Bicycle Advocacy Day each spring, and often meets with his state legislators when they are back in the district. 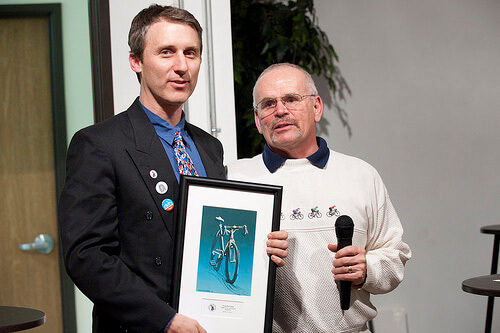 Michael will leave the LMB Board in 2013 and become a member of LMB's Ambassador Program where he will continue his outstanding service to bicycling in Michigan. Re-Bicycle Lenawee is a bicycle co-operative in Adrian, MI dedicated to refurbishing donated bicycles to any person interested in riding for transportation, fitness or fun. Re-Bicycle Lenawee provides bicycle safety education and equipment along with the bicycles. Anyone is eligible to receive a bike, but their priority has always been children, the homeless, those on public assistance and the working poor. The organization has no paid staff, but a small group of volunteers work with clients to repair bicycles and educate them. They also sponsor local recreational rides and support other community events. Donna has been a life long-cyclist, and an inspiration to many since she began long distance touring in her youth in Michigan and New England. In 2003 she rode across America from San Diego to St. Augustine raising $38,000 for Breast Cancer in her 76th year. But riding for her own enjoyment is not the only way she inspires bicyclists. She has been a local ride leader for the past 12 years and continually invites new people to enjoy the sport of cycling. She starts each of her rides with a short lecture on some aspect of bicycle safety. In 2005, she organized the first Ride of Silence event in Boyne City. In 2006 she brought together a wide range of stakeholders in the Boyne City area to improve the interface between cyclists and motorists. Michael Unsworth is a tireless advocate for good transportation policy, serving on dozens of committees at Michigan State University, in the Mid-Michigan region and helping to form and lead the Mid-Michigan Active Transportation Coalition. Having advocated for Complete Streets in both Lansing and East Lansing, Michael is now spearheading an initiative to advance a Complete Streets Ordinance in Meridian Township. Michael has also recently initiated a wonderfully positive and engaging social media campaign called "Operation Soft Serve" to encourage local ice cream parlors to install bicycle parking. He's been a vocal and regular participant in LMB's Advocacy Day over the years. Since 1993 Kathy has been a certified police cyclist, International Police Mountain Bike Association (IPMBA), Certified Police Cyclist Instructor (PCI), and a certified League of American Bicyclist (LAB) Instructor (LCI). In 2004 she consulted with and wrote the "Model Policy" and "Concepts and Issues" publication for the International Association of Chiefs of Police (IACP) regarding police mountain bike patrol. She teaches courses annually for local police bike patrols in Michigan. A story about these trainings was recently featured in LMB's April 2012 issue of the Michigan Bicyclist Magazine. Kathy continues to stay active in LMB, serving on our Education Committee. Anne was the founder of LMB's Sunrise Bicycle Adventure. She served as Tour Director from 2007 through 2011, during the tour's stint in Rogers City. She was instrumental in not only organizing the event, but also working with local government and business officials to support the tour. Her charming personality and upbeat attitude make her an outstanding ambassador for bicycling and LMB. 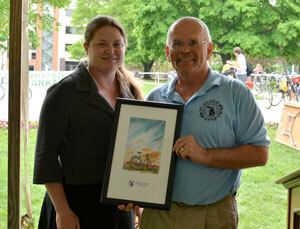 She continues to work with local organizations to promote both bicycling and the "Sunrise Side" of the state. 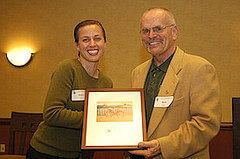 The GGRBC was loosely formed in 2008 by cycling champions involved in the Green Grand Rapids planning. 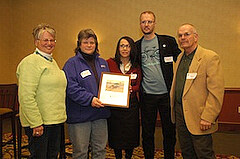 It applied for and received a Bronze Level Bicycle Friendly Community designation from LAB for Grand Rapids (2009). It's held two successful GR Bike Summits (2009, 2011); hosted three successful Bikestock bicycle and music festivals (2009, 2010, 2011); successfully advocated for the City of GR to pass a Complete Streets Resolution (2011); revised and updated the Bike GR map (2011); further developed partnerships and relationships with bicycling groups, clubs and city officials; conducted GR's first bicycle count/survey (2011); created a Bicycle Friendly Employer program (2011); launched its own website (2011); launched a bicycle safety education program to area elementary schools (2012); Enhanced its Bike to Work Week and renamed it Active Commute Week (2012); and continues to advocate for Complete Streets and improved bicycle infrastructure with board members sitting on key local task forces and through its advocacy campaign. Bill was LMB's first webmaster and hosted the LMB website on his company's server since the site was established over 15 years ago. He is responsible for LMB having a coveted three letter domain name -- LMB.org -- when he secured it in 1997. Over the years, Bill has served as a LMB tour volunteer and participant. He is a past member of the LMB Board of Directors and served as Vice Chair and Treasurer during his tenure on the Board. He also created and maintained MichBike, a forum for Michigan bicyclists to discuss bicycling related topics. He has been especially helpful to staff on web related issues, a true behind the scenes hero to the organization. In addition to these well deserving recipients, LMB is excited to announce two new awards named in honor of two great advocates of cycling. 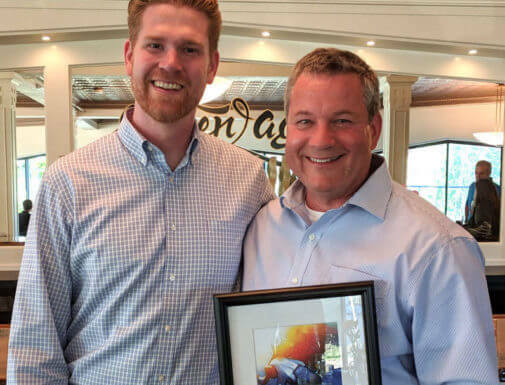 The Ralph Finneren Encouragement Award is named for Ralph Finneren, an avid cyclist who tragically was killed last year when he was struck by a motorist while riding his bike. Before his death, Ralph spent his life riding and encouraging anyone he met along the way to join him. 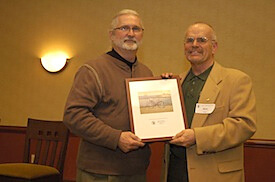 Ralph lived what he taught, and LMB honors him, by naming this award after him. 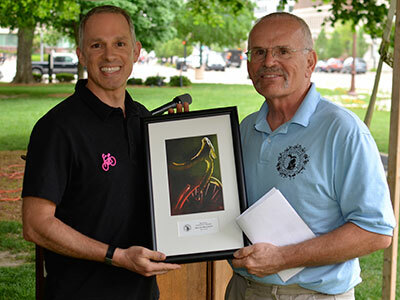 The second new award is The Bob Gibbs Passion for Pedaling Award. Bob has spent his entire life on his bike, and his accomplishments are detailed below, as the inaugural recipient of this award. 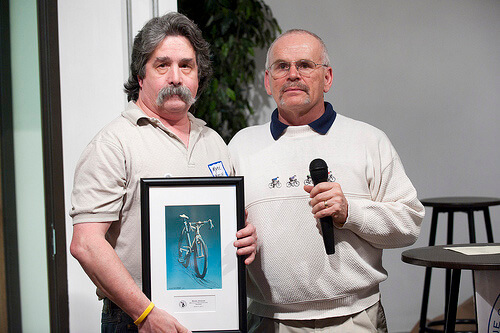 Bob's genuine passion for cycling has inspired many to ride, and therefore we are pleased to recognize him with his own award. Steve founded and maintains the Michigan Scholastic Cycling Association (MiSCA), which provides unique and inspiring opportunities to bring competitive cycling to high school, and soon to be middle school students. 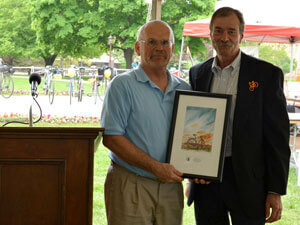 He has been instrumental in helping over a dozen schools start mountain biking programs. Additionally, he organizes numerous races, including two state championships for the MiSCA league. As a component of the annual championship race, MiSCA offers scholarships to the top boy and girl racers, which Steve helped to fund through his solicitations of individuals, local bike shops and corporate sponsors. Bob Gibbs (94) is a lifelong transportation and recreational cyclist who's well known for riding his bike to the start of bike tours - many times with his pet beagle riding shotgun. In previous decades he and his late wife Mary enjoyed riding all over town (and entertaining onlookers) on one of their tandems, again with a beagle in tow. Bob has amassed well over 200,000 miles in his 80+ years of cycling, most of them while simply riding to work on his 1 speed Hawthorne. As a year around commuter he tells stories of traveling Grand River Ave. in a blizzard and actually passing other automobile traffic. LMB looks forward to next year's award nominations and being able to honor a new set of great advocates. Once again, we congratulate our 2012 recipients and sincerely thank them all for all of their dedication to making Michigan a more bicycle-friendly state. 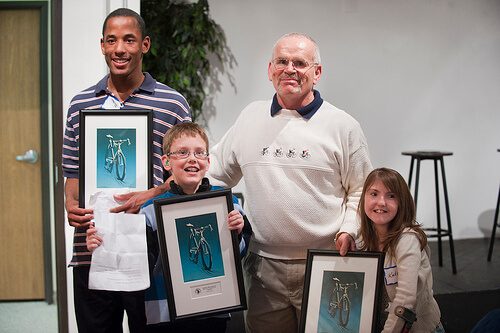 Our 2011 Bicycle Advocate Award is shared by Katie Birchmieir, Conor Waterman and James Klemola. They are inspiring young advocates who each wrote and delivered personalized testimony in support of Complete Streets before the House and Senate Transportation Committees last year as well as presenting in front of the Michigan Disabilities Caucus. Their powerful heartfelt testimony played an integral role in convincing the State Legislature that Michigan needs to routinely provide safe transportation options for users of all ages and abilities. These youth gave up part of their summer vacations so everyone can benefit from better cycling opportunities across Michigan. These tireless young advocates were amazing and demonstrated, no matter how young, everyone has a voice that can be heard. Connor summed it up best with his acceptance speech, "When I go out on the street, I just don't want to get squished." Katie, Conor and James also had the honor of being special guests of Governor Granholm at the Complete Streets bill signing in August of 2010. 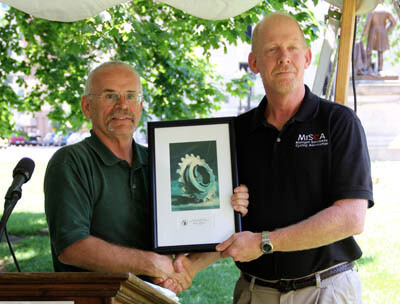 Our 2011 Bicycle Education Award goes to Mark Hagar. 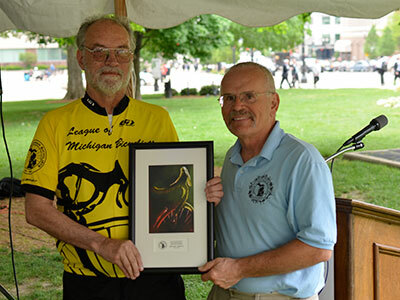 Through his efforts with the Ride of Silence, an event to honor bicyclists injured or killed by motorists, Mark has helped educate bicyclists and motorists across the state of Michigan about the importance of sharing the road. As the Vice President of The Ride Of Silence, he created the highest concentration of ride locations anywhere on earth, with over 30 Michigan locations last year. 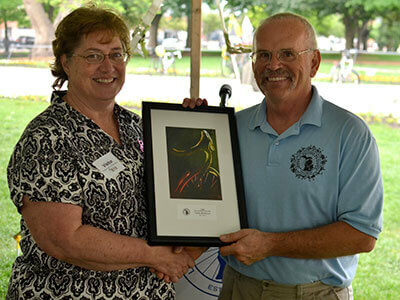 Tim Potter, LMB's Volunteer of the Year, is a longtime volunteer for LMB and is quick to help with all of the organization's events based in the Lansing area. He plays an integral role in the organization of the Michigan Bicycle Summit and the Lucinda Means Bicycle Advocacy Day. In addition he regularly helps pass along LMB's bicycle safety and education message through various communications outlets. When he's not volunteering for LMB, running the MSU Bikes Service Center or attending the National Bike Summit, he spends his time organizing community rides as well as serving as secretary and webmaster for the Ride of Silence. Peckham, Inc. through its Ability Tour, one of only a few fully accessible bicycle tours in Michigan for people with disabilities, and through their annual sponsorship of the Michigan Bicycle Summit has demonstrated a strong commitment to the advancement of bicycling in Michigan. In addition to hosting the Michigan Bicycle Summit, Peckham routinely participates in the Lucinda Means Bicycle Advocacy Day and is a key partner in the Michigan Complete Streets Coalition. 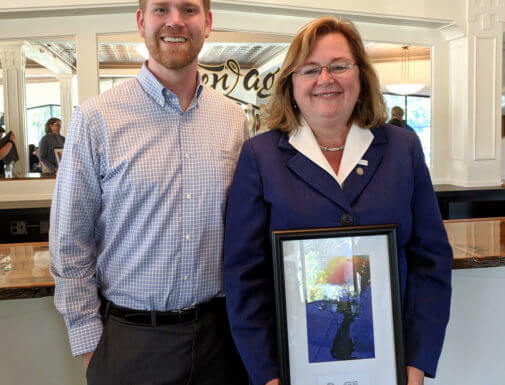 Since receiving this award, they have already stepped up their commitment to bicycling by expressing a desire to help other bicycle tours across the state become more friendly to hand cyclists and other bicyclists with disabilities. Additionally, Peckham has committed to providing more bicycle parking for its employees and hopes to apply for the League of American Bicyclists', Bicycle Friendly Business program in the near future. The Dougherty's have been key volunteers in the history of LMB and it is our great honor to recognize them with our 2011 Distinguished Service Award. Jim served on the original LMB Board, helping to secure the original financing for the organization. Jim was also a key member of the group that began the first Shoreline West Bicycle Tour, which continues to be a major funding source for LMB's efforts to make Michigan a more bicycle friendly state. 25 years later he is still intricately involved in the Shoreline West Tour. Mary has also been a loyal long-time volunteer for LMB, serving as SAG Coordinator for our West and other Tours for 24 years. Currently they both serve as the Ride Leaders for the West Tour. But it doesn't end there; they are regularly volunteering to be part of LMB activities, whether at events or just helping out in the office. As co-chair of the Walk and Bike Lansing Task Force, Jessica Yorko emerged as the leading voice in the Lansing region in promoting bike-friendly infrastructure and policy. 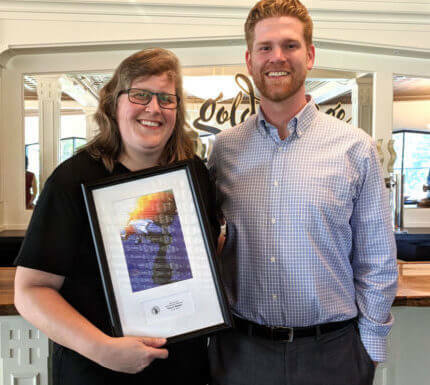 Working on behalf of the Mid-Michigan Environmental Action Council, she has brought awareness to the crucial role that bicycling plays in health and community design. She has chaired monthly taskforce meetings for several years to find ways to make the City safer and more appealing for bicyclists and pedestrians. On top of chairing this Task Force and producing most of its work products, Jessica annually organizes the Smart Commute week, which encourages area commuters to choose active ways to get to and from work. Under Jessica's leadership, scores of volunteers conducted a signature collection drive in Lansing that gathered over 5000 signatures of registered voters in support of Complete Streets. She also spearheaded community engagement meetings with over 40 neighborhood and community organizations in and around Lansing, and several design charrettes in March 2009. The unanimous passage of the Lansing Complete Streets and NonMotorized Plan Ordinance was a great victory - one that would not have happened without Jessica Yorko. The Lansing ordinance is not only the first of its kind in Michigan, it was the 100th policy passed in the United States, putting Lansing in the national limelight. Michael and Claudia Aughenbaugh attended their first LMB Advocacy Day in 2007. This experience energized them and help them develop a commitment to educating people about bicycle safety. They not only have continued to attend the Advocacy Days but have also attended all of the Michigan Bicycle Summits. These experiences have provided them with the encouragement to improved bicycling in their community. This past summer they were and integral part of a team of LMB members that worked with the West Bloomfield Parks and Recreation Commission to host the 2009 West Bloomfield Bicycle Safety Day. They also made valuable contacts with the West Bloomfield Police Department. Over 300 children along with their parents took part in the event. From Michael and Claudia's contacts with the West Bloomfield Police Department, Rich Moeller, LMB Execeutive Director was invited by the Department to take part in a TV show about bicycle safety. They Aughenbaughs continue to reach out to others in their community in various ways and are a shining example of what we can to in our communities to educate people on bicycle safety. Mike Egan was one of the first people I (LMB ED Rich Moeller) met when I came to Lansing. In fact he and Phil Wells took me out to my first dinner when I came to town. Mike is one of the true "grunts" of the volunteer world. He is always volunteering for the tough jobs. John and I stopped calling Mike to volunteer along time ago, because we know that if there is an event, we would receive a call from him the week before asking what we needed to be done. He has helped set up, tear down and be a participant in events ranging from the Bicycle Summit, various expos and LMB's annual Advocacy Day. He has served on various planning committees and is currently on the Shoreline West 25" Anniversary Tour committee and will be volunteering on the 2010 Shoreline Tour. Whether we need a hand moving something, counting election ballots or making smoothies with our smoothie bike, Mike is always there front and center. When Michael and Claudia Aughenbaugh (see above) and the other LMB members approached the West Bloomfield Parks and Recreation Commission about hosting a Bicycle Safety Day, they were received enthusiastically with supportive arms. 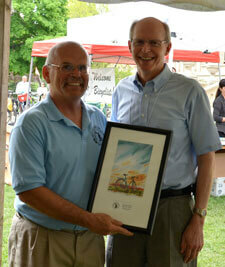 The Commission was very supportive in helping to insure that the 2009 West Bloomfield Bike Safety Day was a success. Working with local bicycle shops and other volunteers, the Commission collected and destributed over 300 helmets during their Bike Safety Day. It went so well that they now plan to make it an annual event. LMB is extremely pleased that West Bloomfield is working very hard to embrace bicycling and to improve the safety of bicyclists throughout their community. Joyce Halstead has been involved with the LMB since 1990 when she rode Shoreline East. Joyce served on the LMB board trom November 1997 through January 2008 and has been an office volunteer for over 10 years. Joyce served as the registrar for the Shoreline Tours for three years and for the GTA Tour for one year. She also worked as a crew member on the Circle Tour for one year and the GTA Tour for two years. She has marked the East half of ODRAM and worked at the finish at Bay City State Park for at least 5 years. Throughout the years, Joyce has also attended many bicycling workshops and educational seminars. As a member of the Tri-City Cyclists since 1988, Joyce has also served Tri-City Cyclists as Membership Coordinator for all but three years since 1996, Advocacy Committee Chairperson since 1997, Vice President 1991, Director-at-Large, Midland 2002, 1998 and 1990. 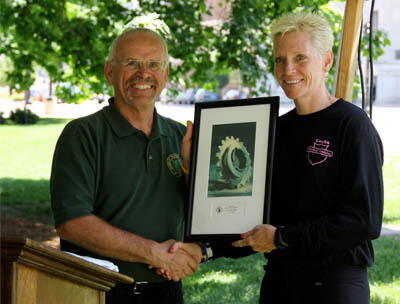 In 2003, Joyce received the Art Moll Achievement Award from the Tri City Cyclists. 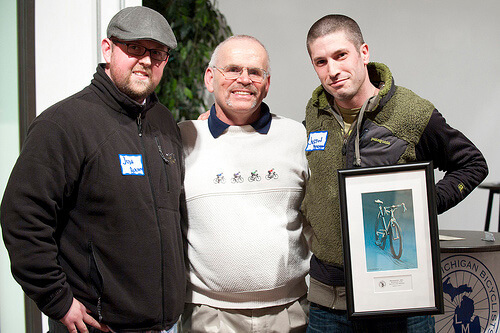 The Art Moll Achievement Award, also known as the Tri-City Cyclists Excellence Award, recognizes individuals for their outstanding contributions to cycling and the cycling community. 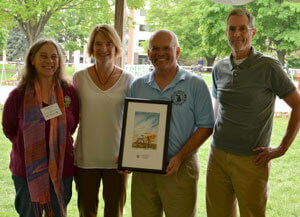 After leaving the LMB board due to term limits, Joyce joined the board of the Friends of the Pere Marquette Rail Trail. Despite leaving the board, Joyce continues to volunteer for LMB in various ways.